German dermatologist; born at Berlin Jan. 2, 1845; died at Breslau March 2, 1882. Educated in his native city (M.D. 1868), he took a postgraduate course at the University of Vienna. During the Franco-Prussian war he saw active service as assistant surgeon. In 1871 he returned to Vienna, but in the following year settled in Berlin, where he became privat-docent. 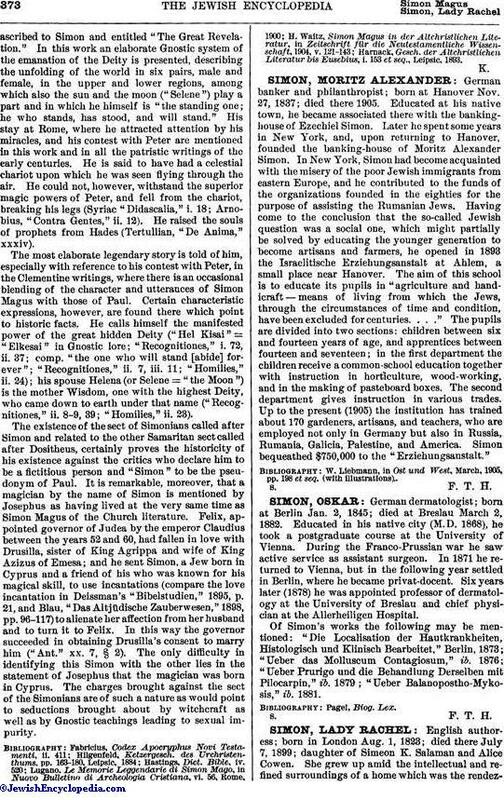 Six years later (1878) he was appointed professor of dermatology at the University of Breslau and chief physician at the Allerheiligen Hospital. Of Simon's works the following may be mentioned: "Die Localisation der Hautkrankheiten, Histologisch und Klinisch Bearbeitet," Berlin, 1873; "Ueber das Molluscum Contagiosum," ib. 1876; "Ueber Prurigo und die Behandlung Derselben mit Pilocarpin," ib. 1879; "Ueber Balanopostho-Mykosis," ib. 1881.